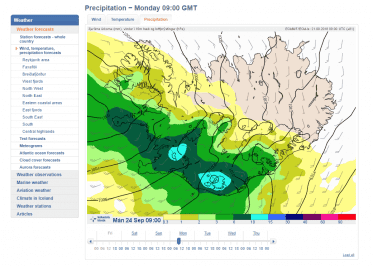 The Icelandic Met Office has a website available in English, however, it can still be a bit tricky to interpret the forecast if you are not used to this format. Before we explain the forecast, its important to note that the forecast is only reliable about 2-3 days in advance. The forecast changes frequently so it is important that you monitor the weather right up until and during your trip. 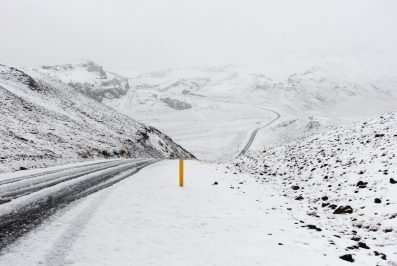 The weather influences travel in Iceland greatly so it is important that you are well informed. 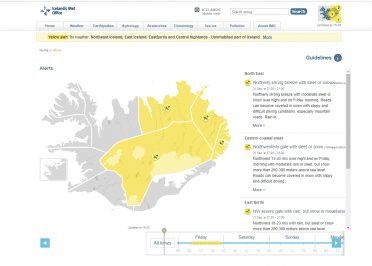 In addition to checking the weather forecast we recommend visiting our website safetravel.is daily to look out for any alerts which are updated daily. 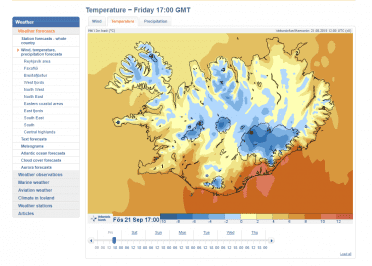 On the Icelandic Met Office’s home page you will see 3 windows for wind, temperature and precipitation forecast. While all 3 will influence your travel, wind is the element that is most likely to give you issues. 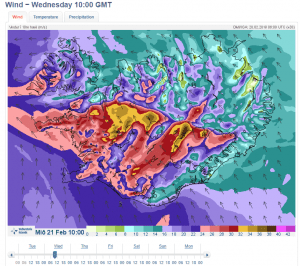 In case of storms or extreme weather you will see the Iceland icon in the upper right hand corner of the website illuminated in the affected regions. Anything on the green spectrum is fine for both driving cars, camper vans and hiking. This represents wind speeds of 0-6m/s (21km/h, 13mph). Hiking starts to get a bit more uncomfortable in the blue range. You may wish to postpone a hiking or camping trip in the upper range of the blue scale 14m/s (50km/h, 31mph) as tents might sustain some damage. If driving be careful when opening doors as they might get pulled by the wind. 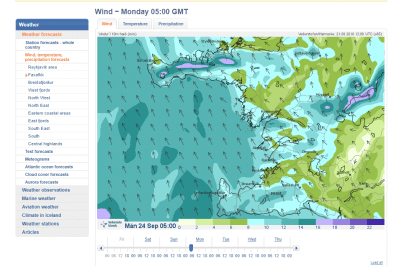 Camper vans and other wind sensitive vehicles may need to consider postponing travel in the upper ranges of the blue wind speed. If roads are icy you may wish to postpone travel at these wind speeds. Hiking and camping is not recommended. Tents will be broken and loose items may fly around. There have been instances in the past of trampolines and hot tubs being moved by the wind. Driving should only be considered if absolutely necessary to get from point A to B as you will likely feel the car being pulled around by the wind on the road. At this wind speed range there can be VERY strong wind gusts which may even cause a car to fly off the road. Camper vans should not attempt driving. If roads are icy driving should not be attempted. 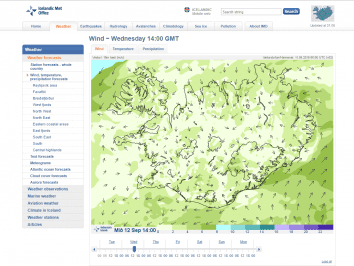 As wind speed increases new colours will appear on the map to indicate higher wind speeds. 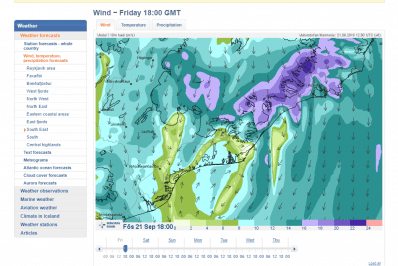 If you see new colours appearing on the map in regards to wind speeds there is a likely a storm forecasted in which case you should seek shelter until the storms passes. The scale does not indicate whether it is snow or rain so you must consult the temperature forecast to see which it is. No colour indicates no precipitation. Heavy precipitation can lead to flooding of areas as well as increased river levels. Make sure you read all 3 forecasts to get a total picture of the weather and what to expect. If you are travelling make sure you check your destination’s weather as well as weather can vary greatly between regions. Something to keep in mind is this is just a forecast, it is subject to change and should not be trusted upon 100%. Always be prepared for a variety of conditions so that you are not caught unprepared in poor weather. If you have questions you can always check in with a safetravel agent for help.